When they weren't pioneering the final frontier and general TV science fiction, Star Trek was pioneering what it means to be a modern fan. It was with them, in the 1960s and 1970s, that all the modern idioms of fandom culture began: in particular, the almighty subculture of fanfiction. 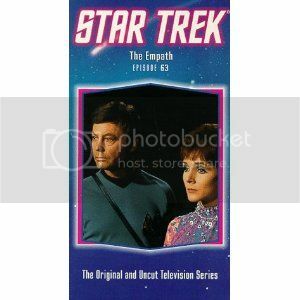 And Season 3's episode, The Empath, is an important historical moment for fanfiction: a fan-written episode which was bought by the producers of Star Trek, it features the three greats schools of fanfiction writing: Slash (homoeroticism), the Mary Sue (wish fulfillment), and some good ol' Hurt/Comfort (self-explanatory!). - and reappear in fanfic playland! Here, every fannish impulse is indulged and, in the style of fanfic, protracted... for a really long... time. Now in a mysterious "room", they meet a beautiful, silent, self-sacrificing alien ballet dancer (Kathryn Hayes, in a body sock) with perfect make-up. McCoy admires her beauty and calls her "Gem" (HA! like JIM, get it? he's so in love), but we at the PPCC will call her by her true name, Mary Sue. Mary Sue is the titular fangirl author stand-in empath, as she has no vocal cords but, like, really, really feels for the intense, palpable love between KirkSpockMcCoy (slash, check). Meet Mary Sue. She will be your guide in these strange lands. 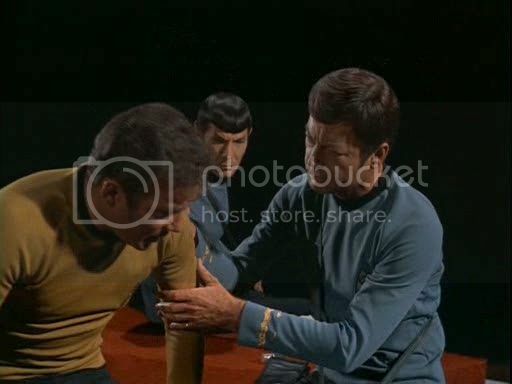 McCoy tends to Kirk's injuries while Spock looks jealously on. Enter the Vians (William Sage and Alan Bergmann), big brainiacs (literally) who like to toy with these characters' emotions. They are the stand-ins for the fanfiction writer's ego (the Mary Sue is the id). For purposes that remain nebulous until the very end, the Vians engage in a little hurt/comfort - first, torturing Kirk and pervily monitoring whether Mary Sue (as well as Spock and McCoy) comforts him. They then show up and demand someone new to torture - after some noble scuffling, McCoy wins and is tortured until he suffers from "blood circulation failure". 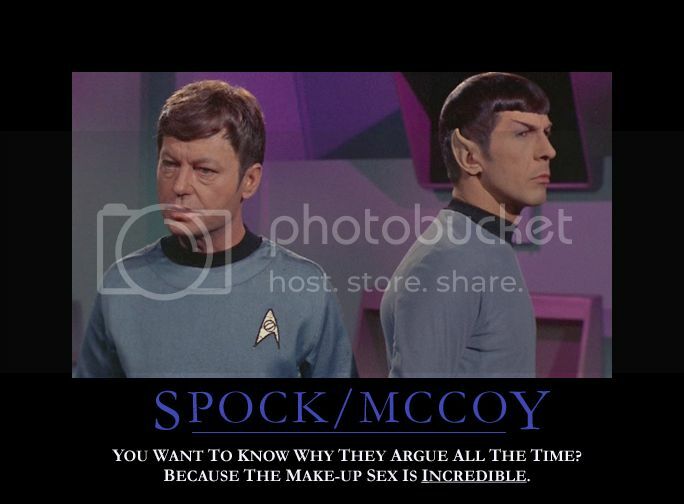 Now at death's door, it's up to Mary Sue - powered by the love of Kirck and Spock, and under the ever-watching Vians/pervy fangirl - to heal McCoy in a very extensive sequence with many shots of McCoy's sweatily/sexily suffering brow. Back in the safety of the Enterprise, KirkSpockMcCoy marvel at how amazing Mary Sue was - "a pearl of great price," supplies Scotty! The end. A hurt McCoy, in the Nth hour of his comforting. No change. The PPCC, after a long night reading horrible fanfic. So we can't really tease too much, as we started writing fanfiction at the tender age of 13 and have never looked back since. It's quite a fascinating (to steal Spock's favorite word) subculture, and it can (and has!) cultivated real literary talents who went on to publish in real, non-fanfic science fiction magazines (that would be us, shazam!). But we've never had any misconceptions about what we were doing (making Obi-Wan Kenobi our boyfriend), whereas some fanfiction authors still try to pretend they're doing something literary and, er, disinterested. But we'll let that argument rest for now. Instead, let's talk about the episode. Well, apart from a LOL moment when Spock and Kirk curse this blasted emo-sucking force field prison, it was a relatively tame contribution to a series we have, by now, come to expect only the most crazy fun from. 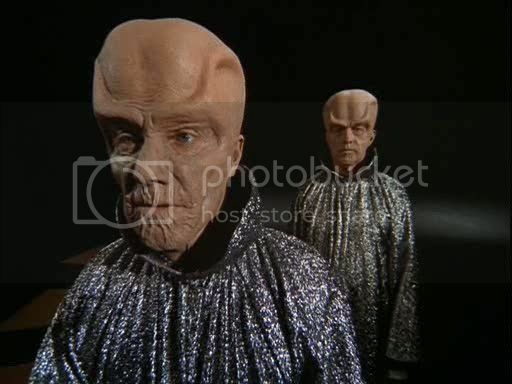 It was like reading the most run-of-the-mill fanfic that misses the whole point of Star Trek (the crazy!) to get another helping of its comfort food (the bromance! ), as played out by our favorite actors. Blah. Much more exciting would be reading some very good (and not scary!) fanfic, such as this one (for McCoy lovers, such as the PPCC) or this one (for Spock fans) or this one (for Pavel/comic relief fans). ajnabi - I would LOVE to see some of this analysis. Any linkish resources to share? Hmmm. This is an excellent question. I reverted to casual fandom about the time the internet really made a splash in our collective consciousness (about 95 or 96, maybe I was later than most). I'll see if any of the print resources I remember are online and get back to you.